With exome sequencing becoming a tool for mutation detection in routine diagnostics there is an increasing need for platform-independent methods of quality control. We present a genotype-weighted metric that allows comparison of all the variant calls of an exome to a high-quality reference dataset of an ethnically matched population. The exome-wide genotyping accuracy is estimated from the distance to this reference set, and does not require any further knowledge about data generation or the bioinformatics involved. The distances of our metric are visualized by non-metric multidimensional scaling and serve as an intuitive, standardizable score for the quality assessment of exome data. In recent years, next-generation sequencing (NGS)-based exome screens have become an invaluable tool in Mendelian disease gene discovery and are now being introduced as clinical diagnostic tools for genetic disorders of high phenotypic and genetic heterogeneity [1, 2]. Various solutions for exome enrichment and sequencing exist and numerous algorithms for sequence read mapping and variant detection are in use [3–12]. There are recommendations for sequencing depth and benchmarks for the distribution of sequence read coverage over the target region. The common core of the diverse approaches to sequence exomes represents the consensus coding sequences as defined by the consensus coding sequence (CCDS) project . The majority of publications  related to this field seem to confirm that a mean sequencing depth of this target region with high quality short sequence reads should be above 50-fold and more than 90% of the CCDS exons should be covered by at least 10 sequence reads for diagnostic purposes. Another recently introduced parameter for the quality assessment of multiple read alignments is the variance of the ratio of reads that support the alternate allele at heterozygous positions . The lower this variance, the lower the error rate to be expected from amplification artifacts. The ratio of transitions versus transversions (ti/tv) and the proportion of variants that are already listed in databases of genetic variation such as the Single Nucleotide Polymorphism database (dbSNP)  are measures of quality that may be applied to the entire variant call set of an exome. The ti/tv ratio should be close to 3:1 for the CCDS exons, and the proportion of singletons should be below 10% . However, the ti/tv ratio is influenced by the target region, whereas the number of novel variants may depend on the background population. The higher the amount of non-coding variants, the lower the ti/tv ratio, and higher proportions of novel variants may be observed if the sequenced individual is from a population that is poorly represented in the variant databases. Although these parameters may serve as valuable indicators for quality they do not directly indicate the accuracy of a sequenced exome and to our knowledge there is no criteria for assessing whether the variants identified by whole exome sequencing represent a comprehensive list. Specifically, it is not possible to estimate an exome-wide false positive or negative rate for variant detection that is purely based on the quality scores of genotype calls. Sequencing technology-specific error signatures  can yield artificial variant calls of erroneous high quality and result in an underestimated proportion of false calls, while poorly adjusted bioinformatics pipelines for data processing may lead to missed calls. In most NGS studies, a Phred-like quality score is provided for each called genotype. This score describes the confidence in a genotype call. Based on a certain likelihood model for genotypes, the Phred score represents the probability that the genotype call is wrong, given the reads in an alignment ( Phred score = - 10 l o g 10 P r ( w r o n g g e n o t y p e ) ) ). In a model that assumes, for example, a Bernoulli distribution of the sequence reads at a heterozygous position, the Phred score of a heterozygous genotype would decrease the more the ratio of reads supporting the alternate allele deviates from the expected value of 0.5. However, this quality score not only depends on the raw data but also on the mapping algorithms and probability models that were used for variant calling. That means that processing the same raw data by different bioinformatics pipelines may result in different distributions of quality scores, suggesting different genotyping error profiles for the same exome. Even variant calling approaches that are based on similar Bayesian methods do not yield the same genotype probabilities due to different priors , and methods of quality score recalibration cannot completely adjust for that effect (Additional file 1, Table S1). In order to enable interoperability and platform independence, we have developed a method to measure the accuracy of a set of variants by assessing its composition. In our metric, the distance between sets of variants from two exome samples is computed without considering genotyping quality scores. The basic idea is that the distance between variant sets of comparable quality is closer than the distance between variant sets of very different quality. In our comparison, the variant data of individuals of the 1000 genomes project  serve as a gold standard and we refer to them as the reference set. If the genotype concordance between the reference variant call set and the test variant call set is high, this suggests a comparable sequencing quality. We will show in the following that the distance of a test sample to this high quality reference data is an indicator for the genotyping accuracy of the exome. Genomic DNA of European individuals was enriched for the target region of all human CCDS exons with SureSelect Human All Exon Kit (Agilent, Santa Clara, USA) according to the manufacturer's protocol and sequenced on a HiSeq 2000 (Illumina, San Diego, USA), yielding more than 5 gigabases raw sequence data per exome. The Charité University Medicine ethics board approved this study, which conforms to the Helsinki Declaration, and we obtained informed consent of all participants. Publicly available NGS raw data and variant calls of 1,063 individuals of different populations were downloaded from the ftp server of the 1000 genomes project . Exome variants of these individuals served as reference variant sets in our work. Exome variants of the 5000 exomes project and of de Ligt et al. were used for testing the accuracy predictions [20, 21]. Exomes of test samples were enriched with Human All Exon SureSelect baits from Agilent and sequenced on Illumina Genome Analyzer IIx and Illumina HiSeq 2000 as 100 bp single-end reads or paired-end reads according to the manufacturers' protocols. Short sequence reads were mapped by Novoalign (Novocraft, version 2.08) or BWA to the reference sequence GRCh37. Variants were detected with default settings with SAMtools  or GATK  on bam-formatted alignments . Variant calls in variant call format (vcf)  were restricted to single nucleotide changes and to the consensus exome target region of the 1000 genomes project. Additionally, sites that were classified as technical artifacts by the 1000 genomes project were ignored. and W i j ( k ) = 2 f x i k + f x j k .
This means that for the same genotypes the indicator I is weighted by the reciprocal of the genotype frequency f x i k , which is based on the reference set with an appropriate background population. To give an example, a genotype for individual i at a given position k , x i k = c h r 6 : 79595096 = C / C , would refer to a genotype frequency f x i k = 0 . 999 , if 1 out of 1,000 individuals in the reference set differs from this genotype. For genotypes that were present only in the test sample but not observed at all in the reference set, we set their frequency to 1 / ( n + 1 ) , where n is the total number of individuals in the reference set. where C i j = ∑ k W i j ( k ) is used as a normalizing constant. Therefore, a disagreement at a position of low variability in the reference set contributes more to the total distance than one at a highly variable position. In the resulting distance matrix, D , pairs of individuals who are 'closely related' can be distinguished from those who are distinctly apart by lower distance values. Thus, a distance d i j = 0 means total agreement of all genotypes and a distance value of d i j = 1 means total disagreement of all genotypes. where | | ⋅ | | defines the Euclidean norm. For coverage-adjusted comparisons, we randomly removed sequence reads from the original alignments. Variants were recalled on these down-sampled exomes as described above. As genotyping accuracy we define the percentage of the entire exome that was correctly genotyped, that is the sum of true positive genotype calls (alternate and reference genotypes) divided by the entire size of the exomic target region. For our simulations, we assumed that the reference set had a genotyping accuracy of 100% and introduced genotyping errors at random positions. As most of the exomic positions had low variability in the reference set, the contribution of genotyping errors to the distance function could be approximated by adding twice a binomial distributed random variable, X ~ B N , p * 2 , to the normalizing constant C i j , with probability p equaling the specified genotyping error and the number of trials N = 2 . 8 * 1 0 7 bp is the total size of the exome,. Distances between all individuals of the reference set were measured and the averaged values of the median and interquartile range of all columns of the distance matrix were computed to standardize the median of a test sample. The median of the distances from a test sample to all individuals of the reference set was computed and normalized by subtracting the pre-calculated median of the reference set and dividing the interquartile range (IQR) of the reference set. 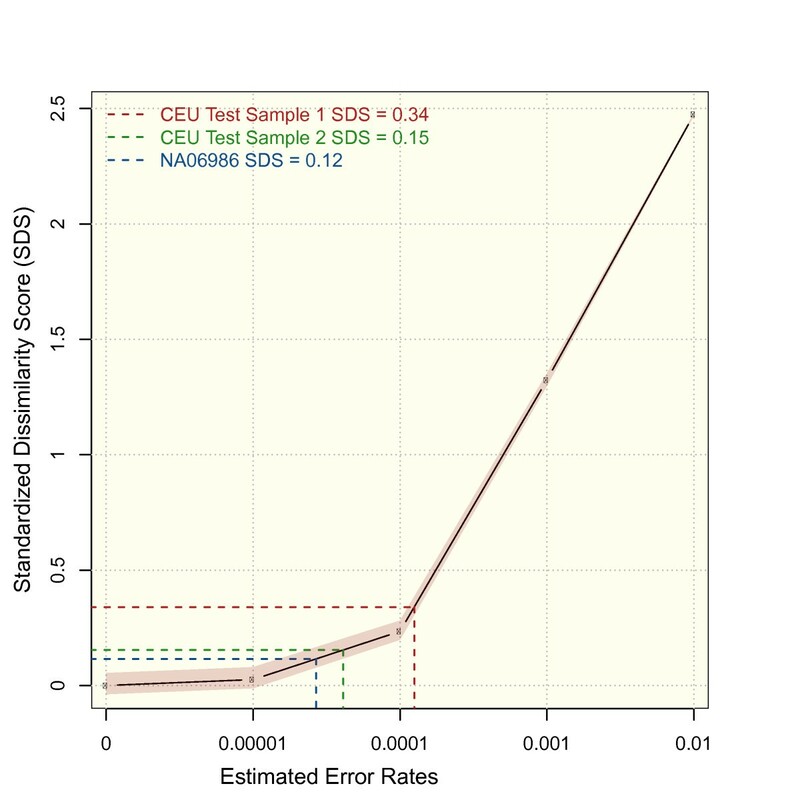 The reference curve and both 5% and 95% quartiles for the standardized dissimilarity score (SDS) were computed for the reference set and simulated data sets of decreasing error groups. Like any metric, the distance measure that we used to compare different sequences of a set of test samples induces a topology. Variant calls, which describe the measurable differences between samples, represent true genetic variation, as well as genotyping errors. The subject of our work is the quality assessment of a set of exome genotypes, thus our metric needs to induce a topology that is sensitive to sequencing errors while being robust to true genetic differences. By using a weighting method for genotypes that uses their frequency of occurrence, we achieved higher precision in accuracy prediction compared to an unweighted hamming distance (Figure S1 in Additional file 1). If two samples are not the same at an exonic position, which is highly constrained in the population, this contributes more to the total distance, because such an event has a higher probability of being a genotyping error than divergent genotypes at a highly variable site of the exome. When we compare two exomes, our metric works on all genotypes that have been called in these samples. The genotypes are weighted by the degree to which the genotype is constrained in the population. Though several definitions for measuring the degree of genotype conservation have been suggested [26, 27], most variable positions in the human genome are biallelic and for simplicity we approximate the conservation of a genotype by the inverse of its frequency. Thus the differences in two variant sets are weighted by their respective genotype frequencies, and the detection of many rare variants in a test sample therefore points to a higher proportion of false positive genotype calls. By contrast, if many variants that are common in the population are not detected in a test sample, this points to a high false negative error rate. By this means, we compute a matrix that contains the distances of the test sample to all the samples of a reference set as well as their mutual distances. These distances are a result of a function that works on the entire exomic target region, as defined by the 1000 genomes project, and may therefore be viewed without distortion only in the multivariate, exomic space. We have implemented and tested our method using whole exome data, but it could be applied to other types of high-throughput sequencing data. However, the precision of predicting the accuracy of genotyping decreases for smaller target regions (Figure S2 in Additional file 1). Because distance is based on multiple variables of weighted categorical data, visualization in a plane requires a transformation. We tested several standard techniques of data visualization and found that non-metric MDS  showed the best characteristics in conveying the differences in genotyping accuracy in two dimensions (Figure S3 in Additional file 1). We therefore project the exomic distance matrix into two artificial dimensions of Φ1 and Φ2 that have the smallest loss of information [29–31]. The reference samples of the 1000 genomes project form clusters according to their ethnicity (Figure S4 in Additional file 1) and for any test sample we chose the closest cluster as the best matching reference set. Samples from the same population background form homogeneous clusters in non-metric MDS scaling, indicating a comparable genotyping quality (Figure 1A). Similarities of exome samples. (A) The similarity between exome samples is measured with a genotype frequency weighted metric. The similarity matrix is visualized by non-metric multidimensional scaling in the two-dimensional plane. Variant sets of individuals of European descent that were analyzed by the 1000 genomes project form a homogeneous cluster, irrespective of the applied sequencing technology. (B) Two test samples of the same ethnicity that we genotyped according to a standard exome protocol are compared to samples of the reference set. The larger distance of sample 1 to the reference cluster indicates a lower genotyping accuracy, while sample 2 points to a high quality. We then analyzed two test samples of European descent but of unknown genotyping accuracy and included them into the MDS projection of all central European (CEU) individuals from the 1000 genomes project, which is shown in Figure 1B. Except for one representative recalled sample, NA06986, all individuals of the CEU reference set are displayed as black circles, whereas the two exome test samples are represented by the colored triangles. Although the mean sequence coverage of the exome target region is above 60× for both test samples, they clearly differ in their mean distance to samples from the reference set: the second sample is close to the cluster formed by the individuals of the reference set, whereas the first sample is an outlier, indicating inferior quality. This considerable difference in the mean distance is remarkable given the high sequencing depth and a comparable ti/tv ratio of 3:2 (Additional file 1, Table S1). Also the proportion of variants found in dbSNP is around 97%, which is comparable to NA06986. Only the variance of the heterozygous allele frequencies, which increases with a growing number of artifacts from the amplification steps during the library preparation, suggests a lower quality for sample 1 with var(het AF) = 0.017 compared to 0.012 in test sample 2 and 0.013 in NA06986 at the same mean coverage . We measured the mean distance to the reference set for 85 exomes of European descent that were all analyzed in the context of NGS research projects. The two samples displayed in Figure 1B illustrate the extreme spectrum of the mean distance to the reference set that we encountered. We hypothesized that variants often detected in exomes of the 1000 genomes project, but not in the outliers of our test samples, might point to a subset that requires high data quality to be properly detected and that might explain partly the separation from the reference cluster. 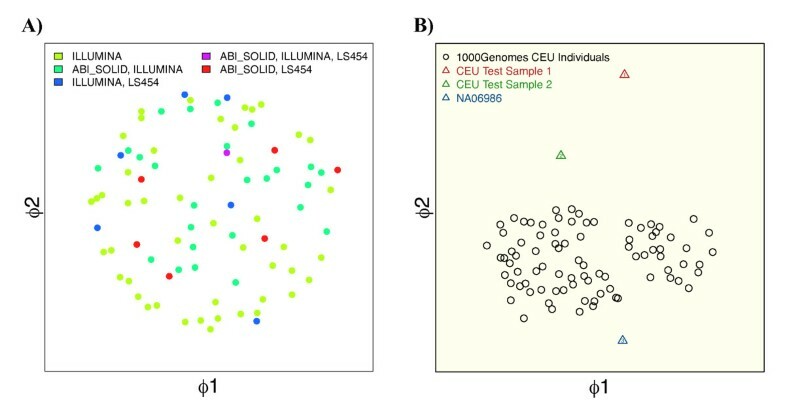 Figure 2A displays the value pairs of variant allele frequencies that are based on 85 CEU individuals from the 1000 genomes project and 85 exome test samples. For technical replicates one would expect all allele frequency value pairs to lie close to the diagonal in this kind of visualization. For two sample sets of equal size that are drawn from the same population, one would expect a certain degree of variance in the measured allele frequency that is simply based on the finite sample size: given the allele frequencies one would expect for a sample size of 85 that about 95% of the frequency value pairs fall inside the boundaries of the displayed ellipse based on a Bernoulli distribution. However, in our case there are considerably more outliers than expected by chance. Analysis of low quality samples. (A) Comparison of variant allele frequencies in different sample sets. Value pairs of genotype frequencies were computed for exomes of the reference set (CEUs from the 1000 genomes project) and compared to test samples of the same ethnicity that are low quality. The ellipse indicates twice the standard deviation assuming a binomial model for the allele frequency p. Variants in the right lower quadrant were called with a lower probability in our test samples and are characterized by a GC content that deviates from the expected mean. (B) GC content at false negative positions. Variants that are underrepresented in exomes with a large distance to the high quality reference set are overrepresented in exome regions with high GC content (violet curve). The green curve indicates the distribution of the GC-content that is expected for an equal number of variants that are randomly drawn from the exome. (C) Coverage against GC content. The mean sequence coverage of the consensus exome varies with the GC content of the target region. The overall coverage for an exemplary sample from the 1000 genomes project (NA06986) was higher compared to test samples 1 and 2. Test sample 1 has a particularly low coverage in regions with extreme GC content, suggesting a higher error rate. We looked for similarities of these outliers and computed the GC content of 100 bases flanking the variant alleles that were present in more than half of the individuals analyzed in the 1000 genomes project but in only one or less of our analyzed samples. The distribution of the GC content of these variants clearly deviates from the distribution that one would expect for randomly located variants in the exome (Figure 2B). To investigate the reasons for the higher false negative error rate for variants in a GC-rich sequence context, we computed the mean read coverage of the target region depending on the GC-content. Figure 2C shows that the distribution of the coverage is smaller for test sample 1 compared to test sample 2 and NA06986 that was sampled down to a comparable mean coverage. Thus, the higher distance of test sample 1 to the reference set is partly due to a critically low sequence read coverage of regions with an extreme GC-content. Benjamini et al. studied the bias caused by GC content depending on read coverage in detail for Illumina sequencing data and showed that it also varies between technical replicates . This also means that two samples may have different genotyping accuracy for the whole exome although they have been processed by the same protocol. We hypothesized that the distance to the high quality reference set should grow when the amount of raw sequence data decreases. We therefore successively reduced the sequence coverage in the raw exome data of NA06986, called variants anew, and observed an increasing distance to the reference set (green to blue circle in Figure 3). A decreasing sequencing coverage will not only yield an increasing rate of false negative genotypes but also increase the rate of false positive calls. It is more likely that a sequencing error will be called as a heterozygous variant, and a heterozygous variant as homozygous, if the position is only covered by a few reads. We then analyzed how an increasing false positive error affects the distance to the reference set by simulating detection artifacts that were randomly distributed over the target region and added to a sample from the reference set. The triangles in Figure 3 show that the data points follow a trajectory that departs from the reference cluster with growing error rate. 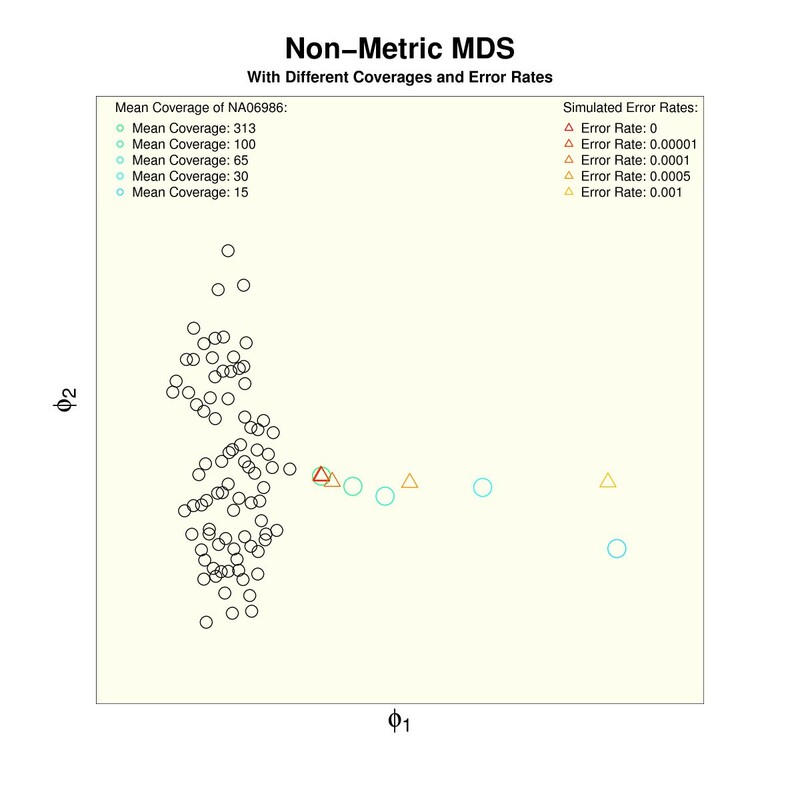 It has to be noted that the visualization of multiple versions of the same test sample that differ only in coverage or error rates in a single MDS plot contorts the relative distances. All the depicted simulated data points in Figure 3 originate from the same data set and are therefore self-similar. The self-similarity is high for a low error rate and high coverage and decreases with increasing error rate and decreasing coverage, as the divergent trajectories of circles and triangles indicate. We also obtained similar results in the analysis of simulated data sets of other ethnic backgrounds (Figure S5 in Additional file 1). Distance to the reference set for decreasing coverage and increasing error rate. A reduction of the raw sequence amount for a randomly chosen sample of 1KG project, NA06986, reduces the similarity to the reference set (green-blue circles) indicating decreasing genotyping accuracy. A similar effect is observed when simulated genotyping errors are added to the variant calls (red-yellow triangles). A decreasing similarity of the test samples results in divergent trajectories. A genotyping error of 0.00001 corresponds to an expectation of one genotyping error in approximately 100 kb of the target region. Two randomly chosen samples from the reference set would differ in about 100 positions in such a window of 100 kb . The samples with the simulated error rate begin to separate from the high quality cluster for error rates above 0.00001, which corresponds to a positive predictive value of 0.99 (number of true positive divided by number of positive calls). Interestingly, the positive predictive value that was reported by Tennessen et al. for the variant calls of the 5000 exomes project is between 0.97 and 0.98 . The resolution of our visualization techniques is therefore sufficient to display these qualitative differences. In contrast to the 1000 genomes project, the genotype calls from the 5000 exomes project were publicly available only in a collapsed form as genotype frequencies for European Americans and African Americans and not as separate variant sets for each sample. In addition to our in-house exome data, we also analyzed the distances to the reference cluster for exomes that we simulated based on the genotype frequencies from these European Americans and 100 exomes that were already studied by de Ligt et al. . Figure 4A shows the distribution of the SDS, which represents a normalized distance of a test sample to the reference cluster. The mean SDS for the simulated exomes of the 5000 exomes project is comparable to our exome data and lower than the SDS of the de Ligt et al. exomes. The smaller variance of the SDS distribution in the 5000 exomes samples, which points to a higher self-similarity, is due to a simulation process that did not properly represent the haplotype substructure of the data. The higher mean SDS of the de Ligt et al. data is mainly explained by outdated genotyping algorithms with higher error rates and a lower mean coverage of the target region. Figure 4B depicts the coverage distribution over the exome and additional quality parameters for an exemplary sample from de Ligt et al. and our two test samples. Distributions of standardized dissimilarity scores for different exomes. (A) 100 samples, including test samples 1 and 2, were sequenced on the Illumina platform with mean coverage above 60×. The mean SDS for the Illumina samples is comparable to the mean SDS of 100 exomes that were simulated based on genotype frequencies from the 5000 exomes project. The variation of these SDS is smaller due to missing haplotype information. (B) The mean SDS of 100 exomes that were sequenced on a Solid platform is considerably higher due to a lower and less uniform sequence distribution over the target region and due to less accurate variant calls. By simulating increasing sequencing noise for all exome data sets of the 1000 genomes, we derived distributions for the mean distances of the original data. Based on these distributions, we computed a reference curve for the SDS of an unknown sample that correlates with its exome-wide accuracy (Figure 5). The SDS that is measured for our test samples may be used for estimating their genotyping accuracy by intersecting with the reference curve. For test sample 1, the mean distance to the reference set was 0.29, which corresponds to an estimated genotyping error of 0.0001. By contrast, the SDS of 0.11 for test sample 2 indicates an error rate that is much closer to that of the 1000 genomes project. Interestingly, the distance to the reference set shows characteristics of a phase transition, when the contribution of genotyping errors exceeds the genetic variability between individuals. We also checked the validity of our approach by deriving the genotyping accuracy via a complementary method. In Heinrich et al., we analyzed the effect of amplification steps during sample preparation and derived rates of genotyping errors from technical replication . The SDSs for these replicates indicate genotyping accuracy for the exomes between 99.99% and 99.999%, which is in good agreement with the previously computed accuracy. Estimation of genotyping errors from standardized dissimilarity scores. The reference curve with its 5% and 95% quantiles is based on the distances of samples with simulated error rates to the reference set. The SDS of a test sample indicates its error rate by its intersection with the reference curve. The estimated error rate of test sample 1 is considerably higher than of test sample 2 and of NA06986 from the 1000 genomes project. 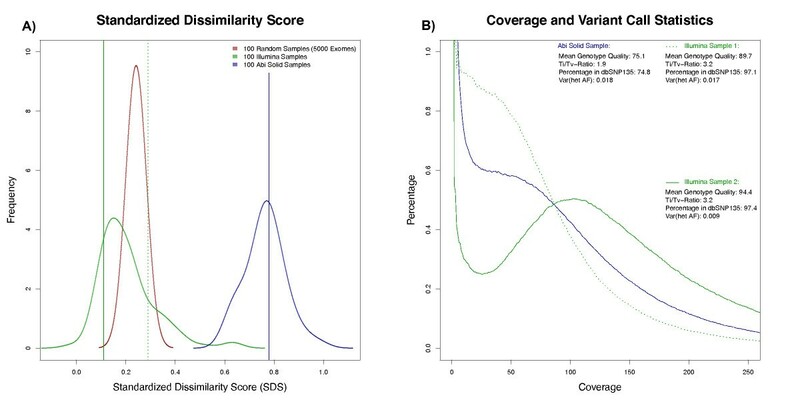 SDS, standardized dissimilarity score. Thus, the SDS is a parameter derived from the composition of a variant set and is even more powerful in predicting the data quality than other quality control parameters such as coverage distributions, which require access to the read alignments (Additional file 1, Table S1). We tested the influence of the sequencing platform on the error prediction by our approach by restricting the reference set to samples that were sequenced with the same technology (Illumina). Although the visualization in metric MDS clearly shows that the test samples are closest to the Illumina samples from the reference set (Figure S3 in Additional file 1), the effect of the sequencing platform on the accuracy prediction is marginal (Figure S6 in Additional file 1). The SDS is therefore robust and can be applied to predict the quality of genotyping data from different sequencing technologies. We used the platform independence of our approach to analyze the quality of a sample from the 1000 genomes project, NA12878, that was recently re-sequenced by a new technology (Proton, Ion Torrent, aligned with TMAP and genotyped with variantCaller). 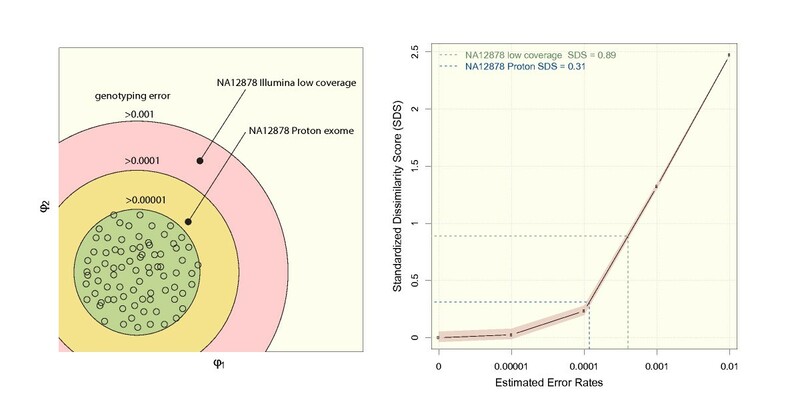 In Figure 6, the distance of this Proton variant set of NA12878 to the reference set is compared to a variant set of the same individual based on Illumina raw data that was down-sampled to a mean coverage of 30 fold as described above. This figure visualizes how the quality of two exomes of the same individual that were generated on two different sequencing platforms and processed by different bioinformatics pipelines may be interpreted at a glance. We used the SDS to estimate the genotyping accuracy and predicted 99.9% for the low coverage Illumina exome and above 99.99% for the Proton exome, which is in good agreement with the values based on Sanger validation for this sample. Comparison of exome data of different NGS platforms. A) Exome genotypes of individual NA12878 were called based on an Illumina read data set of low coverage and a Proton dataset. The Proton exome is closer to the CEU reference data than the low coverage Illumina exome. B) The accuracies of the exome genotype sets were estimated based on the mean distance to the reference set. We have described a new approach to assess the accuracy of variant calls from NGS studies. The genotyping accuracy for variant calls, that is genotypes that differ from the true sample sequence, has been estimated in large-scale NGS-based projects such as the 1000 genomes project  or the exome sequencing project  and comparisons of NGS platforms . In these projects, samples were sequenced to a very high mean coverage on different sequencing platforms and the reported variants represent an intersection of technical replicates and independent analysis pipelines. Even in these high quality data sets, up to about 2% of the variants cannot be validated if re-sequenced by a complementary approach such as ABI Sanger. In such a high quality exome, one detects around 15,000 single nucleotide variants per 30 Mb coding sequence and approximately 300 of them are likely false positive calls, which corresponds to an error rate of 300/30*106 = 0.00001. Based on simulated accuracy groups for variant calls, we were able to assess the quality of an exome test sample without detailed knowledge of the applied enrichment and sequencing technology or of the bioinformatics pipeline that was used to align the reads and call the genotypes. The SDS is therefore suitable for a comprehensive quality control in all exome-based mutation screens and might turn out especially useful as a criterion for data inclusion in studies that combine exome data of different sources, due to its platform independence. The estimated genotyping error in particular might serve as quality criterion before variants detected in an exome are further analyzed: only if the estimated error is comparable to that of a high quality reference set such as the 1000 genomes project would one proceed with variant analysis. We envision that our approach to estimate the genotyping accuracy of exomes will facilitate the quality assessment of NGS data. Software that computes the SDS, visualizes the distances to data of the 1000 genomes project, and predicts the genotyping accuracy is available for download and as a web service at GeneTalk . ratio of transitions versus transversions. This work was supported by a grant of the Deutsche Forschungsgemeinschaft (DFG KR 3985/1-1) to PMK. We thank Christian Gilissen and Joris Veltman for providing solid exome data and Michal R Schweiger and Martin Kerick for cancer exome data for analysis. The authors would like to thank the NHLBI GO Exome Sequencing Project and its ongoing studies, which produced and provided exome variant calls for comparison: the Lung GO Sequencing Project (HL-102923), the WHI Sequencing Project (HL-102924), the Broad GO Sequencing Project (HL-102925), the Seattle GO Sequencing Project (HL-102926) and the Heart GO Sequencing Project (HL-103010). VH, PNR and PMK conceived and designed the study. VH developed the original code, TK and DP implemented modifications for GeneTalk. JH contributed exome data. JS and TD supervised and contributed to the statistical analysis. VH, PNR, TD and PMK wrote the paper. All authors read and approved the final manuscript.